Six weeks ago, Air Force Maj. Charles Stahlmann, who also is a practicing physician, was living in a gentrified downtown Washington, D.C., neighborhood and working at Walter Reed National Military Medical Center, where he was completing his fellowship in pulmonary and critical care medicine. But life and the military have a way of presenting amazing new opportunities. When Dr. Stahlmann finished his fellowship, he was offered a transfer to Las Vegas and a position with the Mike O’Callaghan Federal Medical Center at Nellis Air Force Base. Stahlmann bought a car and headed West. 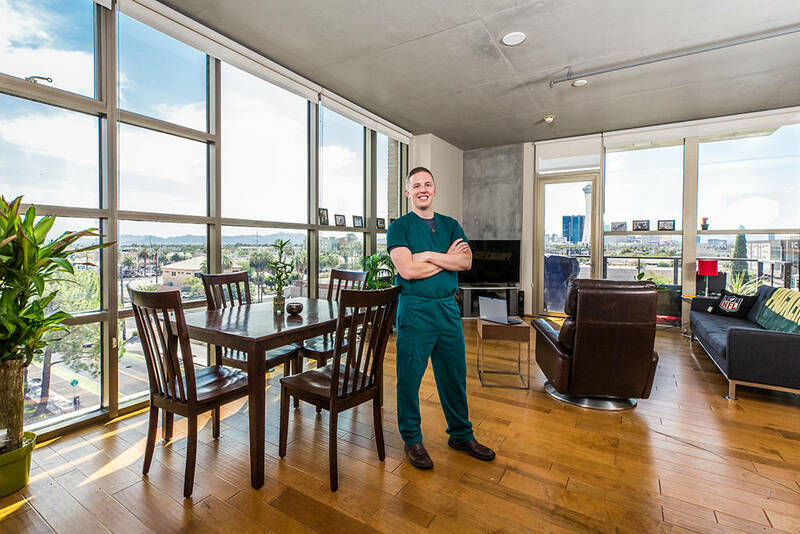 Almost immediately after arriving in Las Vegas, he bought a two-bedroom, two-bath condominium at Juhl, a loft-style community spanning an entire city block in downtown Las Vegas. The corner residence has spectacular views of the Strip and the mountains. Having lived for three years in downtown D.C., Stahlmann was accustomed to finding almost everything he needed within walking distance. He knew he wanted a similar urban lifestyle in Las Vegas. As soon as Stahlmann walked into the two-bedroom residence, he knew it was home. And with the help of a Veterans Affairs loan, Stahlmann was able to close quickly on his new Juhl residence. “I couldn’t be happier with my decision. The home application and Veterans Affairs financing process were seamless, thanks to the outstanding Juhl management team,” Stahlmann said. “I’m a single guy with an active lifestyle and a very busy professional life,” he said. With working on the medical staff at Nellis’ O’Callaghan Medical Center, Stahlmann also works with the Southern Nevada Veterans Hospital and University Medical Center. In his free time, he has been hiking at Mount Charleston, which he found more demanding than expected, and is exploring the Arts District neighborhood. “I couldn’t be happier with the maintenance-free lifestyle and the panoramic views from my balconies where I can watch both sunrises and sunsets. Plus, there’s the great restaurants and nightlife just outside my front door. Out-of-town friends have already come to visit, and we just hung out in the neighborhood,” he said. While Stahlmann hasn’t yet had time to take full advantage of Juhl’s abundant resident amenities, he’s looking forward to using the resort-style pool with cabanas, spa, fire pit and vino deck. “I’ve been especially appreciative of Juhl’s onsite concierge service. I’ve had a lot of furniture delivered while I’m at work. The concierge has been really good about handling the deliveries and keeping me informed. The Juhl lifestyle is perfect for busy professionals,” he said. The one thing Stahlmann wasn’t accustomed to before moving to Las Vegas was owning a car and commuting to work. “It’s great that Juhl has a covered parking garage for the first car I’ve owned in years,” said Stahlmann, who also is happy that his drive from home to Nellis takes only about 20 minutes. Juhl is a popular residential choice for professionals and entrepreneurs, especially many who work at firms and courthouses throughout downtown’s expansive legal community. Juhl encompasses multiple buildings, including a high-rise, midrise, brownstones, live-work spaces, retail spaces and a warehouse-style loft building. Many of its residences can be customized via 130 unique floor plan configurations, including several that are one-of-a-kind within the property. Homes at Juhl range from 600 to just under 2,000 square feet and are priced from the high $100,000s. Recently remodeled, Juhl boasts an upgraded resort-style pool with cabanas, lobby and co-op working spaces that cater to its professional residents. Hallmarks of Juhl include flexible floor plans, large terraces and floor-to-ceiling windows that maximize natural light. Private balconies, 10-foot ceilings, energy-efficient design and details, exposed concrete surfaces and mechanicals and upgraded fixtures and surfaces combine to create Juhl’s cool, urban vibe. Amenities include an al fresco movie theater; two-story fitness center with pool and Strip views; 10th-floor vino deck with Strip views; resort-style pool with cabanas, spa and fire pit; 24-hour security; gated parking structure with assigned resident parking; and full-service concierge. A summer kitchen called Canvas Grill is the perfect spot for warm-weather entertaining. And a nearby Urban Garden plot exclusively for use by Juhl residents makes it possible to grow fresh herbs and vegetables in the heart of the city.